Come to join us at RADIO France – STUDIO 105 from 10:00 to 13:00. Moderated by Antoine Lehembre, VP Production at Radio France & Jean-José Wanègue, science journalist & “La Semaine du Son” Administrator and with the participation of ARKAMYS. What if the best place to listen music was your car? 65% of French people think it is the case and 59% like to listen the radio in car & 55% the news. From the individual listening “in bubble” for each passenger to the immersive and collective one, through the spatialized Advanced Driver Assistants System, the next radio consumption in car will be developed following the new driving experiences of smart cars, self-driving cars and fully connected vehicles. 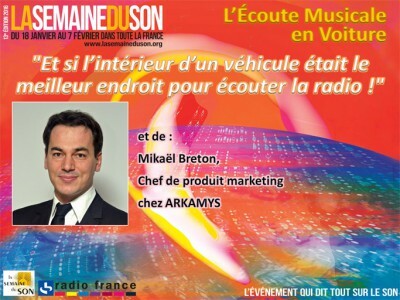 Come to listen to the expert speakers such as car makers, a specialized sociologist and sound & innovation specialist like ARKAMYS.